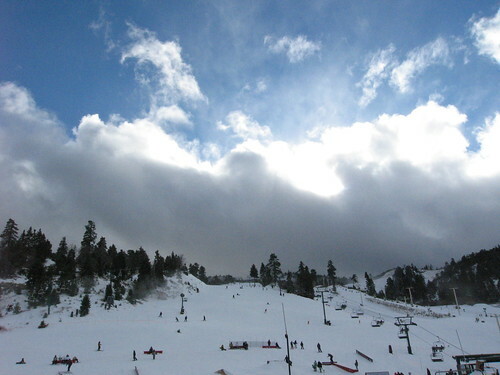 Big Bear Ski Slopes are Open! Big Bear Lake residents are really excited about how early the slopes are open this year! November 9th was the magic “Opening Day” so you will want to check in on Bear Mountain to share in the first snowfall of the season and the buzz of getting to open so early in the season! Forecast for Big Bear Lake, California is a mix of rain and snow this Saturday. It is definitely time to get your gear out and get ready for what looks like an excellent skiing and snowboarding season. Thinking about our Big Bear winter sports has me thinking about the history of skiing in the region and about the kind of skiing our slopes have to offer. If you’re looking for a book to enjoy during your downtime at the ski lodge and want to learn about the history of skiing in our area, check out Skiing in Southern California (Paperback 2007). Big Bear slopes are mostly freestyle skiing. Freeskiing is a non-olympic variety of skiing which combines skiing with street skateboarding, bmx, and inline skating techniques. Freestyle skiing includes: aerials and moguls, skicross, half pipe and slope style. If you want to brush up on your skiing and snowboarding styles, check out this skiing style article for a quick overview. We want you to have a fun and safe visit to Big Bear, so remember that it is always a wise decision to take time to learn the terrain and the uniqueness of the slope that you are on so that you can enjoy the sport without danger. Visit our slope websites, Snow Summit and Bear Mountain for all the details . Happy and safe skiing too all our guests! What’s your favorite style of skiing? Gallery | This entry was posted in History, The Seasons, What to see and do and tagged Big Bear CA, skiing, Snow Summit, weather, What to Do. Bookmark the permalink.